Some people don't have enough room in their home for both a bulky clothes washer and dryer. One solution to this problem is a stacked washer-dryer system, which saves floor space in cramped areas by utilizing what is commonly unused space directly above the washer. 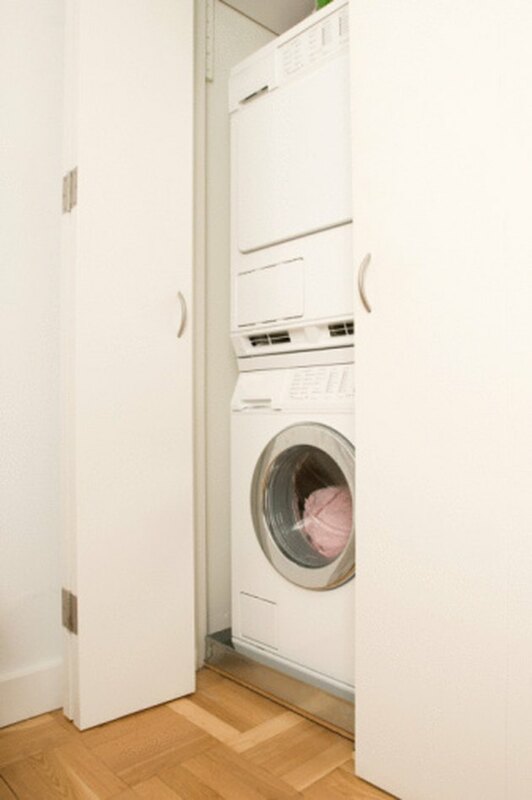 A stacked washer-dryer saves space, but can be difficult to move to a new location. 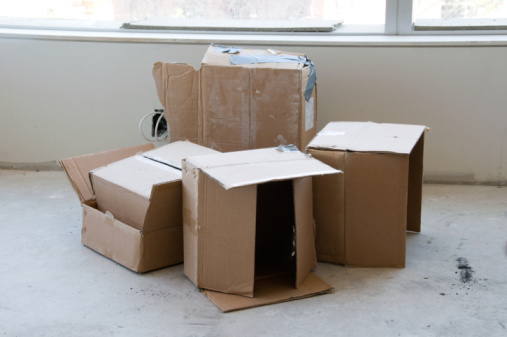 Moving the unit within your house isn't too difficult, however, if you're moving the stacked unit to another location altogether, you'll need to see if you can dismantle it. If the unit separates, follow the manufacturer's instructions for this process, which varies greatly between brands and models. If the unit doesn't disassemble, moving it will be a bit more difficult because of the bulk, but you'll save time and effort by not having to dismantle and then reassemble the unit later. Disconnect all plugs, ductwork, water and gas lines from the back of the unit. Drain as mush water as possible from the hose, collecting the water in a bucket. Wipe down the hose with a towel and bring an extra towel or two for cleanups along the way as you move the unit. Although you may not be able to remove all the water from the line, you'll limit the mess. Open the lid of the washer and place the end of the hose inside to catch any remaining water. Place shipping braces, such as bolts, lockwashers or pieces of foam, into place following the manufacturer's instructions. Many washers and dryers come with a safety device that limits the drums from banging around the unit in transport. If you no longer have those items, contact the manufacturer for suggestions on how to protect your stacked washer-dryer during a move. Wiggle the unit away from the wall far enough so that a friend can get between the unit and the wall to help you mount the unit onto an appliance dolly, which is wider and sturdier than a standard dolly. Tip the unit toward the wall and position the appliance dolly under it. Set the unit down on the dolly and secure a strap around the unit and dolly to keep it in place. Move the washer by tipping the dolly backward. Keep one hand on the unit to help you steer better. Since the unit is tall, you may have problems seeing in front of you, so ask your friend to help direct you through halls and doorways to avoid banging into the walls and door jambs as much as possible. Walk the dolly up the moving van ramp into the truck or ask several friends to help you hoist the unit from the ground up to the truck bed. Remember to bend with your knees when lifting to help avoid back injury. Tip the unit to one side and slip a furniture mover pad, plastic lid or piece of cardboard under each foot. This limits friction on carpet to make moving the unit easier and helps protect wood, tile or vinyl floors from damage. Repeat this process for the other side of the stacked unit until each foot is protected. Push the stacked unit from the bottom to move it to a new location. Although stacked washer-dryer combos tend to be bottom-heavy, pushing from the top may cause the unit to tip over. Have a friend work from the other side of the unit to help pull and guide it through halls and doorways. Remove the mover pads from the feet of the unit when you've moved it to the correct location.